This Ariens Compact 24 Track 2-Stage Gas Snow Thrower with a 208cc engine and electric start is the perfect tool to combat heavy snowfalls. The snow thrower features a 5.5-inch directional track drive for traction over almost any terrain as well as a 200 chute rotation with up to a 50 ft. throwing distance. This 2X Two-Stage Power Snow Thrower is able to tackle the toughest jobs, thanks to its 208cc OHV Cub Cadet engine. Designed for 4+ car driveways and sidewalks, the 2X Snow Thrower performs on both smooth and gravel surfaces, and offers six forward and two reverse speeds. This 3X Cub Cadet Three-Stage Snow Thrower 28" is able to tackle the toughest jobs, thanks to its 357cc OHV Cub Cadet engine. Designed for 6+ car driveways and sidewalks, the 3X Snow Thrower performs on both smooth and gravel surfaces, and clears 50% faster than the 2X. The Jonsered ST1153EP single stage snow thrower is compact and easy-to-use. 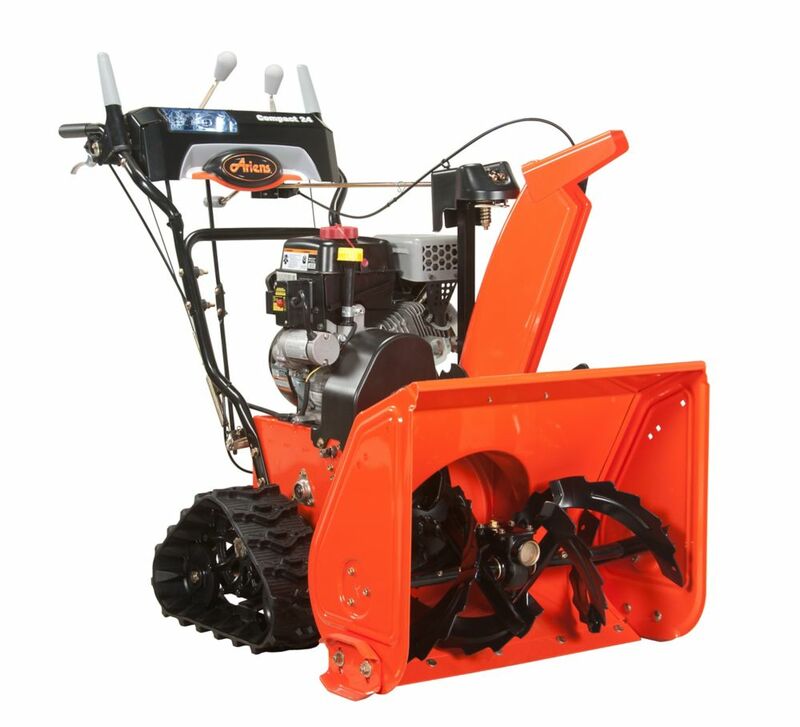 Equipped with a 179cc 4-cycle engine, this unit is suitable for use in new snow up to 13 inches deep and can throw snow up to 35 feet away. Its 21-inch clearing width makes it ideal for hard, flat and narrow surfaces on driveways and paths. The efficient rubber auger ensures optimum clearing on all types of hard surfaces. The electric starter makes it easy to start in cold weather. Its compact design makes it easy to operate and store. Compact 24-inch 2-Stage Electric Start Gas Snow Thrower This Ariens Compact 24 Track 2-Stage Gas Snow Thrower with a 208cc engine and electric start is the perfect tool to combat heavy snowfalls. The snow thrower features a 5.5-inch directional track drive for traction over almost any terrain as well as a 200 chute rotation with up to a 50 ft. throwing distance. Compact 24-inch 2-Stage Electric Start Gas Snow Thrower is rated 4.5 out of 5 by 27. Rated 5 out of 5 by Lance from My wife and I researched snow blowers on line. We... My wife and I researched snow blowers on line. We live in the mountains with steep grades and gravel roads. Upon arrival it took me a couple of hours to carefully assemble and fuel it up. The next morning I cleared our dog yard, approximately 120' by 14'. Snow had drifted to 3' and the ground is gravel and very uneven. This Arien's is a true beast, it cleared the yard in nothing flat. Others warned me about shear pins, so far I have not broken any and the blower I know for a fact has chewed up some down branches and gravel bits. I used it again a few days ago after snow drifted 2' in the dog yard. No problem. This Arien's is worth every penny. And I love the electric start. When its 5 degrees below zero there is no time to be messing with a manual start. Arien's obviously knows what they are doing. Kudos to them and thanks for delivering quality above and beyond. Rated 5 out of 5 by Lou from We purchased the compact track because we have a very steep driveway. Living in North Idaho we ... We purchased the compact track because we have a very steep driveway. Living in North Idaho we get lots of snow so we needed a blower that was going to be effective and safe, My husband is very happy with it. Rated 5 out of 5 by drifter56 from Snowblower was delivered one week ago. Easy to assemble and no adjustments needed. Ran the snowbl... Snowblower was delivered one week ago. Easy to assemble and no adjustments needed. Ran the snowblower around the gravel drive a bit making sure everything was sorted. Good quality and easy to pull start. Tried electric start also and its so smooth. Ive got a long driveway bout a 1/3 of a mile. We get about 6' of snow a winter. I think the blower will hold up. Rated 5 out of 5 by Todd from Little orange snow tank I purchased the compact track to replace my old 28" snowblower. I live in town so I have street parking along with my driveway. Because I have street parking I have to deal with a plow curl the entire length of my property. This snowblower is a little tank. It chews through any amount of snow you put infront if it. I am very pleased with the overall quality, and performance of this machine. It is easy to use and easier to start. I personally didn't think it was difficult to turn or maneuver. I did purchase the optional heated hand grips and they are totally worth it. The spray that Ariens sells is also worth it for wet snot. For once I didn't have problems with wet snow. What a improvement from the old snowblower. I did take it over to my Inlaw's house and this was the ultimate test. Their driveway is a nightmare in the winter. My little orange tank was able to float over all of the stones and cleared it with no problem. It actually pulled me up the driveway!! My only complaint is I didn't get it earlier. I absolutely love this snowblower it has plenty to power and more traction than I ever expected. If I could I would give 10 out of 5 stars. Thanks Ariens for making a great snowblower!! can we organize a pick up at a store instead of a home delivery in a manner to avoid the $199 shipping cost? Thank you for choosing Ariens. Please contact your local Home Depot retail location or 1-800-628-0525 for all purchasing and delivery inquiries.